One thing we love to do in the Anderson Household is have movie nights with the kids. We love to make a big batch of popcorn, grab some snacks and find a seat to enjoy a fun family movie. 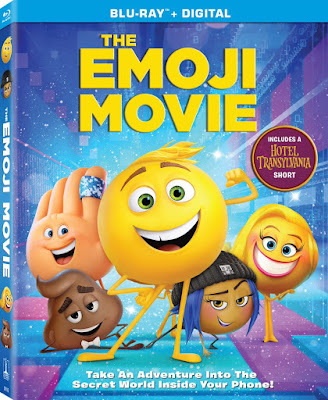 The newest movie to our collection for our movie nights was The Emoji Movie . My kids were super excited when the movie arrived that they watched it twice in one day. The kids loved the movie and Mr. Anderson and I found it to be very cute and entertaining as well. Everyone had seemed to pick their favorite emoji as well from the movie! For me I really like Jailbreak because she reminds me of well me and the kids all really like Hi-5. This animated comedy unlocks the never-before-seen secret world inside your smartphone. Hidden within the messaging app is Textopolis, a bustling city where all your favorite emojis live, hoping to be selected by the phone's user. In this world, each emoji has only one facial expression for Gene, an exuberant emoji who was born without a filter and is bursting with multiple expressions. Determined to become "normal" like the other emojis, Gene enlists the help of his handy best friend Hi-5 and the notorious code breaker emoji Jailbreak. Together, they embark on an epic "app-enture" through the apps on the phone, each its own wild and fun world, to find the code that will fix Gene. But when a greater danger threatens the phone, the fate of all emojis depends on these three unlikely friends who must save their world before it's deleted forever. This movie will make a great gift or stocking stuffer for any kid on your list this year! I am excited to also be giving away a copy this great movie as well! You can download some fun Coloring Pages & Pumpkin Stencils here for your kids to enjoy as well! If you do any of the coloring pages or pumpkin stencils PLEASE POST a picture on Instagram tagging @AndersonsAngels so I can see them!